The net result of the Conservative policy was that by early spring 1862, most U.S. Volunteer regiments in the state, including all those stationed at Cape Girardeau, were withdrawn and marched south to support Ulysses Grant’s developing campaign in Tennessee and Mississippi. Amidst this massive troop movement the Battle of Shiloh was fought in Tennessee on April 6-7 while final Federal assaults were successfully made on Rebel-held Island Number Ten in the Mississippi River near New Madrid, Missouri, on April 8. 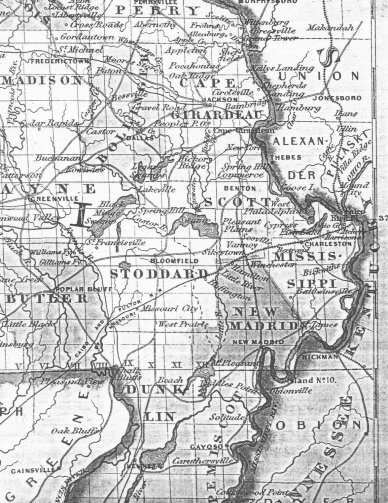 At the very time these major actions were taking place a deadly drama was unfolding back in Southeast Missouri, and in the process a trilogy of conflicts between Missourians came to a head—conflicts not only between Confederate and Federal troops, but also between opposing Union military/political factions as well as two individual Federal officers. They have darkened the Stars, on the Stripes left a stain. Dark treason, thou art baffled; it will never be—never. 2 “Narrative of the Service of Lindsay W. Murdoch In the War of the Rebellion,” Echo, Bollinger County Historical Society, Vol. 1, October, 1979 p. 147-149, 154, 156, 157; National Archives, Pension Record of Lindsay Murdoch, Record Group 704 293. The 11th Missouri State Militia Cavalry Battalion was authorized for recruitment in December 1861, and was not perfected until May 1862, at which time it was redesignated the 12th Missouri State Militia Cavalry Regiment. 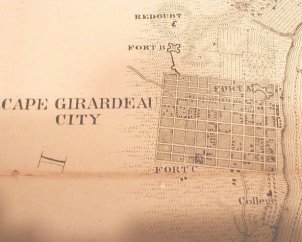 At the time of the Jackson Skirmish the three Cape Girardeau companies recruited by Lindsay Murdoch were autonomous from the other five companies of the developing regiment. 4Murdoch Narrative, 148, 155-157; Murdoch Pension File. For discussions of the schism between the Radical Unionists and Conservative Unionists in Missouri as well as the political conduct of the war in Missouri by President Lincoln, General Schofield and Governor Gamble, see Marvin R. Cain, Lincoln’s Attorney General: Edward Bates of Missouri (Columbia, Mo. : University of Missouri Press 1965); William E. Parrish, Turbulent Partnership: Missouri and the Union, 1861-1865 (Columbia, Mo. : University of Missouri Press 1963); Walter Harrington Ryle, Missouri: Union or Secession (Nashville: George Peabody College for Teachers 1931). 5Murdoch Narrative, 123. Murdoch, postwar commander of G.A.R. Post No. 100, read his five-stanza poem at a gathering in Lutesville, Missouri, on 4 July 1866. See Narrative, 121-122. 8Murdoch Narrative, 147-148. Thomas B. Walker was the son of the sister of Solomon G. Kitchen. Walker’s wife/1st cousin, Martha Lavina Kitchen Walker, was the daughter of the brother of Solomon Kitchen. Cletis Ellinghouse to Kirby Ross, 6 Sept. 2002. Ellinghouse is a newspaperman, author, historian, and genealogist that focuses upon Southeast Missouri. 10Ibid. Fort A was originally referred to as Fort George when the Engineer Regiment of the West constructed it in 1861. See Dr. W.A. Neal, An Illustrated History of the Missouri Engineer and the 25th Infantry Regiments (Chicago: Donohue and Henneberry 1889) 16.